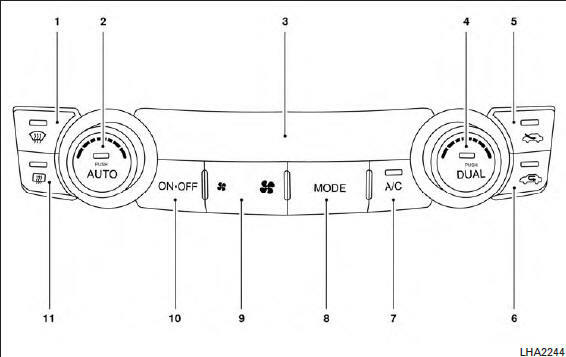 ● The air conditioner cooling function operates only when the engine is running. ● Do not use the recirculation mode for long periods as it may cause the interior air to become stale and the windows to fog up. ● Odors from inside and outside the vehicle can build up in the air conditioner unit. Odor can enter the passenger compartment through the vents. ● When parking, set the heater and air conditioner controls to turn off air recirculation to allow fresh air into the passenger compartment.